Browse our range of title suitable for any walled garden enthusiast as a gift or just for your own reference. 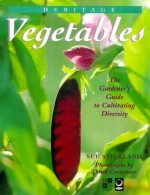 This book celebrates the diversity of our vegetable heritage, discussing why it is important to preserve it, and how we can help in our own gardens. Over 350 old fashioned varieties that have stood the test of time are described, with information on suppliers. Available to buy from Amazon or Organic Gardening Catalogue, Riverdene Business Park, Molesey Road, Hersham, Surrey KT12 4RG. Tel: 01932 253666. See website.